Great Tobacco at an amazing price. I've been purchasing my tobacco from here for over a year now and when i ordered this product when it was brand new i was skeptical to say the least, but from the moment i opened the bag i was amazed. i like menthol and most mint/menthol blends(even the premium) barely even have a menthol taste. the second i smelled the tobacoo i knew i was in for a treat as the menthol stood out and was very pleasent. its taste is just as good as blends 1 1/2-2 times the price. the only drawback i had was it was a little to dry, but that was easily fixed by following the directions provided by tobacco general. i have my own method that is almost identical to theres, althouth i only use there method for when i am going to smoke the tobacco immediatly. normally i use humidor crystals(enough to be at or above 78%) in a breathable container for cigars. i open the pouch and losen the compressed tobacco 1 1/2-2 days before i run out of my current pount and place the humidor crystals in the pouch to sit and slowly add moister to the tobacco. 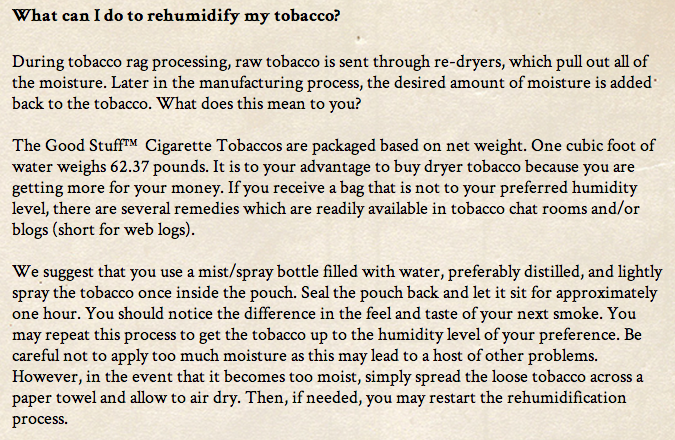 halfway through i tend to mix the tobacco a bt so the dryer stuff at the bottom also gets some humidity. i also tend to keep my tobacco in a airtight coffee container from wal-mart(kitchen section for about $6 usd) with just enough crystals to be around 60-65% humidity for long term storage. you can get the crystals on amazon or ebay for just a couple of bucks which provides enough crystals to handle dozens of pounds at a time. i recommend getting the round marble style over the unshapped ones. this is the first time I have found this site and tried this product basicly for the price but I was amazed.. me and my boyfriend have been rolling our own smokes for about 4 yrs now so we have been through many different blends and brands and are always on the look out for a great menthol tobacco, the more menthol the better and this tobacco has that.. when i first opened the bag it had a very rich smooth mentholy smell to it and a great rich feel.. it goes great with the Royal Majestic Menthol tubes... great combination.. I have a powermatic II electric injector machine and the tobacco and tubes work wonderfully with it.. the finished product tastes absolutely wonderfful.. very refreshing..